BIt’s seldom simple figuring out which, if any, version of a Ubisoft game to buy. Now they’ve made a toys-to-life game that we like, but figuring out which figures and accessories to buy to enjoy Starlink: Battle For Atlas is confusing. Ubisoft complicates things further by allowing players to purchase digital versions of the toys instead of physical ones. Don’t worry, we’ve got it all figured out. Starlink is a game where players assemble starships and use them to fly across planets, battle aliens, hunt for resources, discover new life and explore a strange new sector of space. For those interested in the toy aspect of the game, that means purchasing ships, weapons and pilots and snapping them together on a base that fits on the controller of their game console. Here’s what you’ll need to buy to get that done. 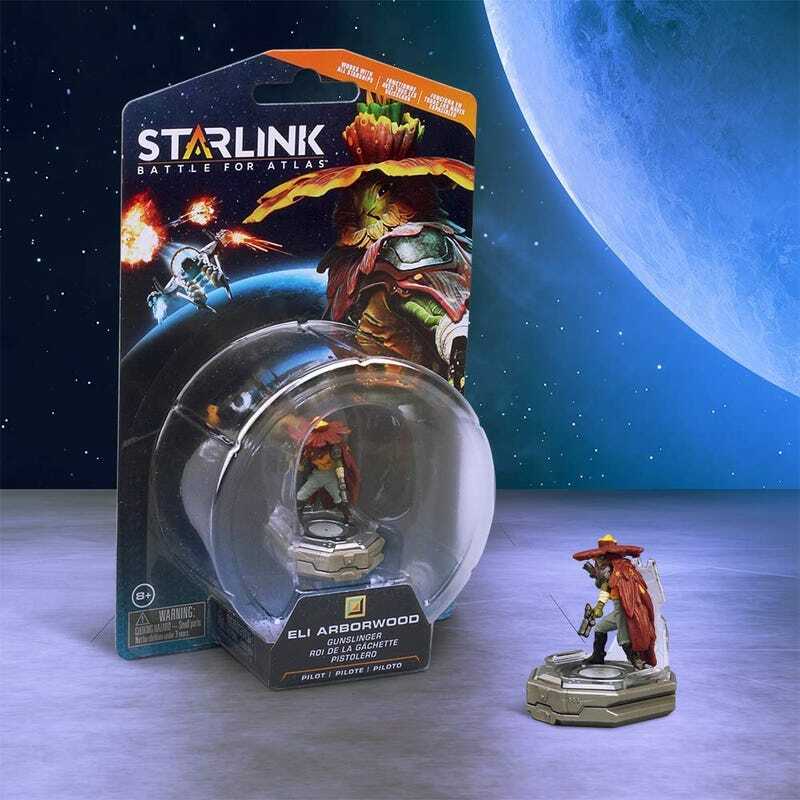 In order to play Starlink: Battle for Atlas with the physical figures and ships, you’ll need a starter kit. Available for PlayStation 4, Xbox One and Switch, the £65 box sets come with the game, a poster and a controller mount for the toys. The kits also come with a single ship, one or two pilots and two or three weapons, depending on the platform you’re playing on. The starter kit gives players what they need to enjoy the game at its most basic level. They’ll be able to play through the entire story with one ship, one pilot and a couple of weapons. There’ll be optional puzzles and chests found during the course of play that will require specific weapon elements to complete. They won’t experience the joy of physical customisation, stacking together three wings on either side of a ship to create a monster machine. But they’ll still have a good time, and they can always pick up more. The PlayStation 4 and Xbox One share the exact same physical starter kit. Along with the controller mount, game and poster, the kit includes main character pilot Mason Rana, the starship Zenith and three weapons – Shredder, Flamethrower and Frost Barrage. 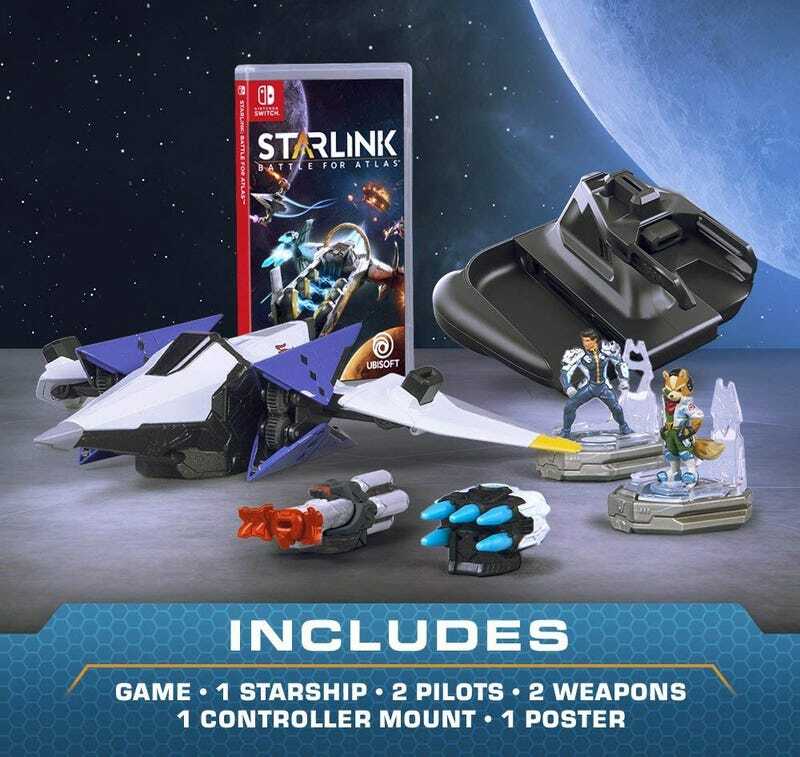 The Switch version of Starlink features Nintendo’s Fox McCloud as an exclusive guest pilot. The furry flier has a huge presence in the game, participating in the main adventure as well as a mission that pits the members of Star Fox against the nefarious Wolf. So the Switch’s starter kit is a little different. While it still includes pilot Mason Rana and the Flamethrower and Frost Barrage weapons, the Zenith has been replaced with Fox’s iconic Arwing and Mr. McCloud himself displaces the Shredder weapon. Both the Shredder and the Zenith ship are included as digital items with the Switch bundle, but there is no current way to buy their physical counterparts outside of a PS4 or Xbox One starter kit. If you’re trying to collect all of the toys, that’s a stumbling block. Note that we’ve seen several reports on Reddit about Best Buy customers receiving their Switch starter kits without a game included. While Ubisoft could not comment on the issue when contacted, those affected report Best Buy has been good about providing replacements. The starter kits are only the beginning. As of launch day, Starlink’s armada consists of 16 different weapons, seven ships and nine pilots (eight and 10 counting the Switch exclusive Arwing and Fox). With the standard starters including one ship, three weapons and one pilot, that leaves a lot to choose from. 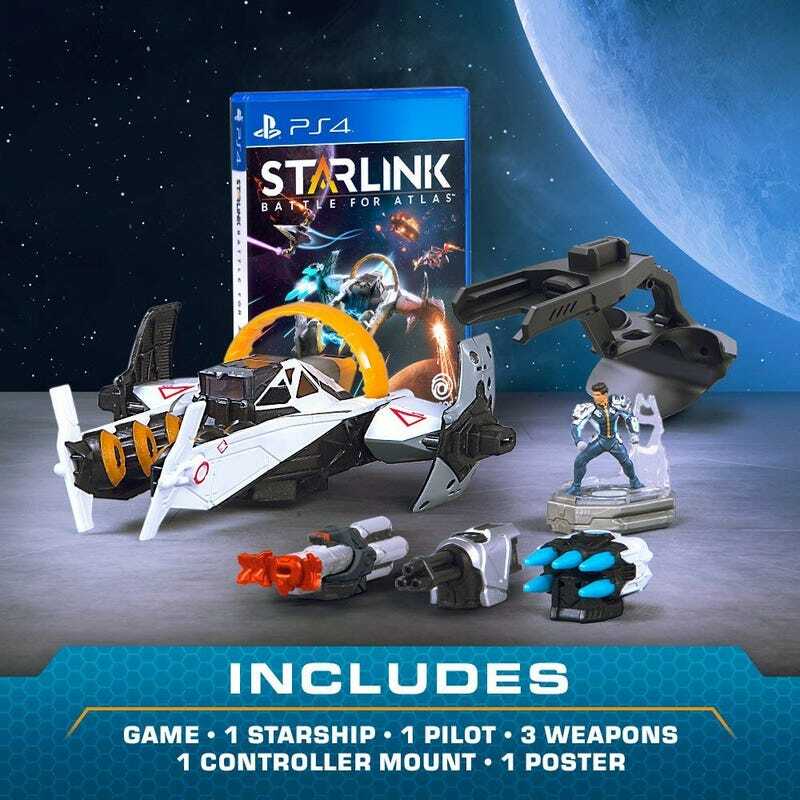 Retailing for £25, Starship packs are the most expensive bits of Starlink’s physical DLC. Each pack comes with a ship, a pilot and a weapon. It’s not a bad deal – these are some nice ships. But there are six of them to collect, which adds up to about £150. Four of the six can be found just about anywhere, while one is exclusive to Smyths toys. 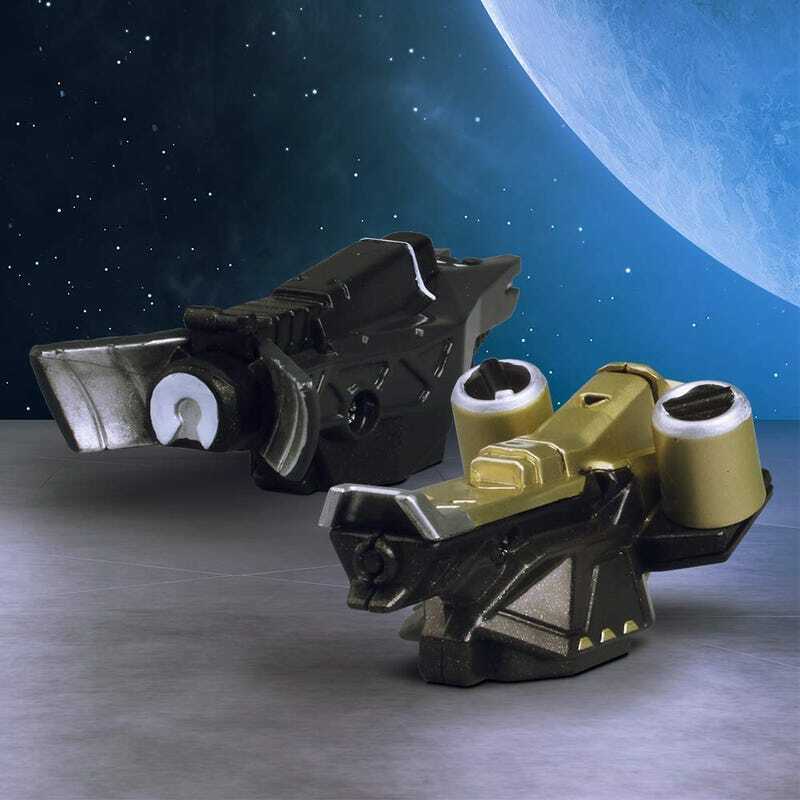 The last of the six, the Cerberus ship, is exclusive to GameStop in the US and as of yet there doesn't seem to be a UK retailer that stocks it. Even the UK Ubistore says "GameStop exclusive". So that's handy. Coming in much cheaper at a mere £10 apiece, weapon packs contain a pair of destructive implements to snap onto your ships’ wings. There are four of these packs available at launch. 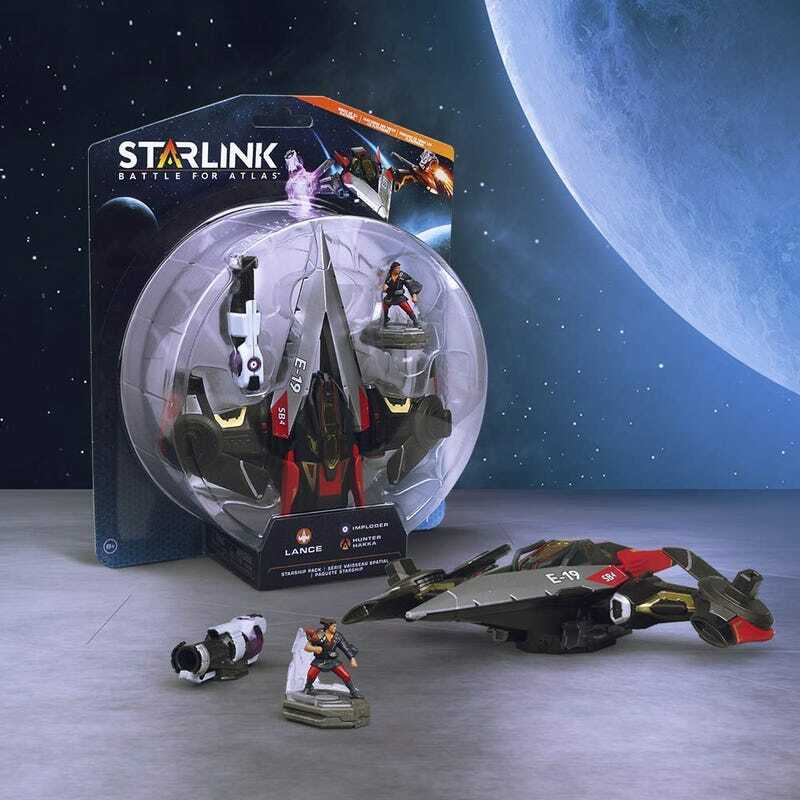 How much would you pay for a full set of Starlink: Battle for Atlas toys? Let’s see. That’s a pretty penny right there. Toss in one of the platform-specific co-op packs, which provide an additional controller base for co-op play and you’re looking at a cool £300. Unless you’re an obsessive collector like me, there’s no reason to spend that much. If you’re merely toy curious, I’d recommend picking up a starter kit and seeing how it feels to play a game with a spaceship connected to your controller. I enjoy looking down and seeing a physical manifestation of my on-screen presence in my hands. Your results may vary. If it’s not your thing, you can always pick up more ships, pilots and weapons as paid digital DLC. 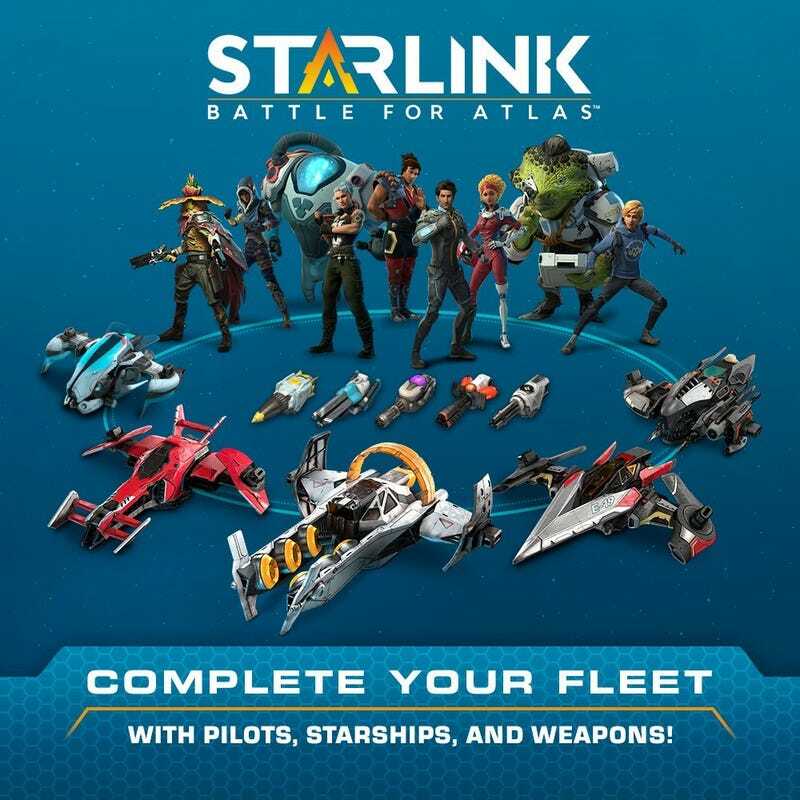 Not wanting to limit enjoyment of this snazzy space adventure to toy fans, Ubisoft also lets folks buy Starlink: Battle for Atlas as a digital purchase. That’s the cheaper way to max out all of the gameplay options that the toys afford, if you don’t mind not having a physical toy for every pilot, ship and weapon. Digital players still have access to purchased weapons, ships and pilots. When they want to swap things around, they just go into a menu. For £90, Switch, PS4 and Xbox One owners can purchase the Starlink: Battle for Atlas digital deluxe edition, which includes nearly everything available for the game at launch. While it does include Razor Lemay and Levi McCray as pilots, their ships, the retailer-exclusive Cerberus and Scramble, are still only available physically. That’s £20 extra for one ship, two pilots and three weapons. Buying those six extra digital toys separately is a bit tricky. The Nadir and Nullifier (along with Razor Lemay) are part of the £12 digital Nadir starship pack. Eli and Kharl are £3.19 apiece digitally, and the Iron Fist and Meteor Mk. 2 would require picking up two digital weapon packs at £5.19 per. If you don’t want to spend an arm and a leg right now but wish to experience all Starlink has to offer, digital is the way to go, but it doesn’t have to be forever. In early November Ubisoft is releasing what it calls “Co-Op packs” for each platform, standalone starship mounts that fit on your Xbox One, PlayStation 4 or Switch controllers. Grab one of those babies and a starship pack, and you’ll be whooshing along with the rest of the toy-playing set. Who knows, if recent toys-to-life trends are any indication, you might even find them on clearance. I’ve spent a few days with Starlink: Battle for Atlas so far, and I’ve found a lot to love. Whether you’re up for a trip to the toy store or prefer your starships in digital code form, it’s a game worth giving a go.